Hello to my fellow sewing friends! Maureen here, from MadeByMarzipan.com. Today I’m going to show you how to sew this adorable cactus pincushion, using my free pattern available on MadeByMarzipan.com. 1) No sewing machine? No worries! You can also sew this cutie by hand. 2) I’m using a 2 ½ inch clay pot that was bought in a pack of three at the dollar store. 3) I also bought these shiny pebbles at the dollar store. 4) If hand sewing a face is difficult for you, you may wish to use a permanent marker instead. 1) Print and cut out the free pattern (click here to be taken to MadeByMarzipan.com, the download link is above the supply list). 2) Fold the fabric so it’s right-sides together, and pin the pattern face-up on top. Cut out the pieces. 4) Sketch a small U-shaped mouth between the eyes. Hand stitch a mouth, using a backstitch so you have a line of stitches with no gaps. (To do this, poke the needle up through where you want the end of your stitch to be. Poke down through where you want the stitch to start. Then start the next stitch by poking up where you want that stitch to end. Poke down right next to the previous stitch.) Don’t forget to finish with a knot on the back. 5) Pin the pieces right sides together. We’re going to leave the bottom inch unsewn, as these will be flaps that are hot-glued to the bottom of the pot. Sew around the perimeter with a ¼ inch seam. 6) Clip the seams, notching the curves. Be careful not to snip your stitches. 7) Turn right side out and poke out the seams. 8) Fill with rice. You’ll need to work the rice down into the arm. 9) Sew across the bottom, leaving a 1-inch flap. Backstitch across the entire length to ensure the rice won’t spill out. 10) Spread the flaps open and add glue to the underside. Press into the bottom of the pot. 11) Fill the empty spaces in the pot with pebbles. Wedge them in tightly. You could also hot glue these if you wanted. 12) Finally, I’m adding a felt flower. I cut mine free-hand but I’ve included a template on the pattern for you. I think red would probably be the best choice, but I went with white since I had it on hand. 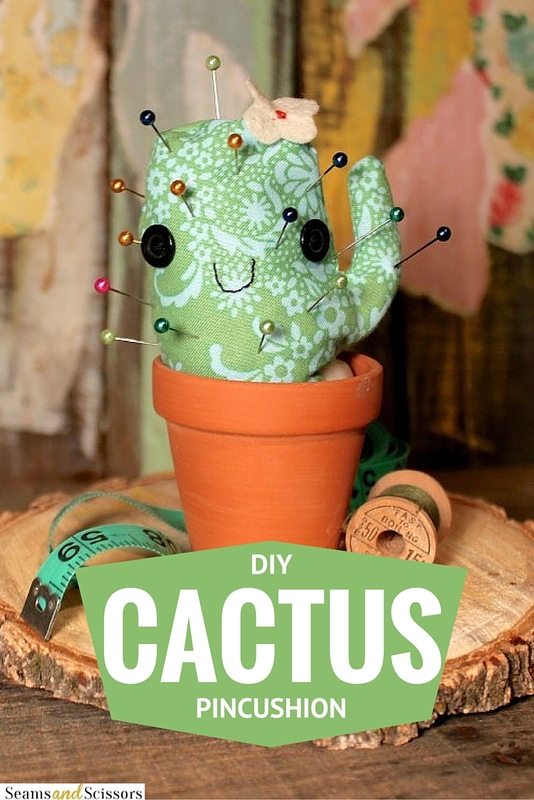 13) Hand-sew the center of the flower to the top of the cactus. You might want to use a contrasting thread. Tie off the knot on the underside of the flower. 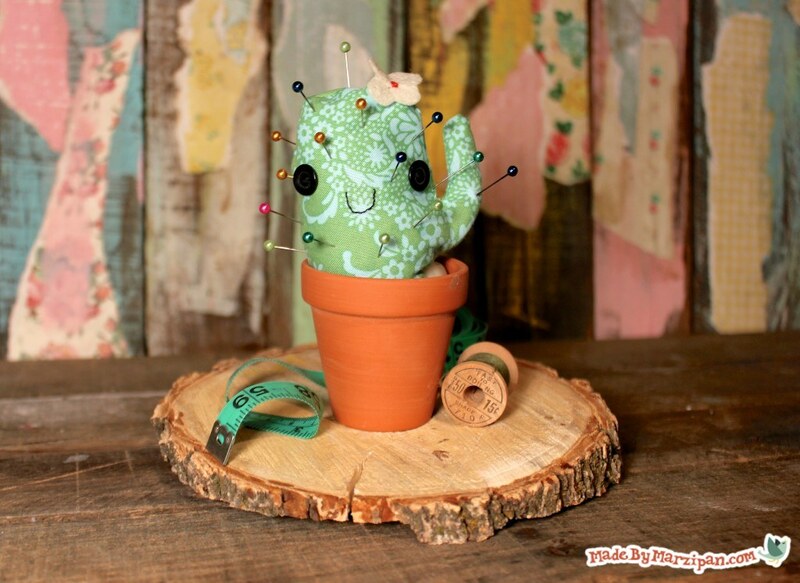 14) Add ball-head straight pins to your new pincushion! I hope you enjoyed sewing along with me today! 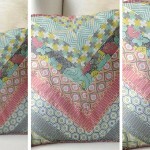 For hundreds more sewing projects, video tutorials, and free patterns, visit my website, MadeByMarzipan.com. Do you prefer traditional pincushions or magnetic ones? Traditional all the way! Not only are they prettier to look at, but they allow the pins to stand up and separate making it easier to grab. I have made several pin cushions and never are two alike! I have both kinds of pincushions but I prefer the traditional pincushions. Thanks for the great giveaway. Actually, neither. I use a box with a curved side, to make extracting a pin easy. I like both types of pincushions. I have one of each by my sewing machine. I have made several different pincushions using my embroidery machine using fun sewing designs. The magnetic ones are more convenient, but there’s also a certain amount of satisfaction in jabbing pins into the other kind. I do slightly prefer a magnetic pincushion, mostly for its capacity. I actually prefer traditional ones. I have one that was homemade for me, so I think of the person who made it every time I use it. I love the traditional pin cushions! There’s nothing like an old fashioned tomato pin cushion with it’s little strawberry full of iron filings hanging from the top! I like both the traditional and the magnetic. I prefer my traditional one because it reminds me of my grandmother and her sewing. I usually keep the magnetic one at my sewing machine. I prefer traditional pin cushions, although I do have a magnetic one. It is so much easier for me to grab a pin quickly and easily from one of the many traditional kinds I have, without sticking my finger! Magnetic pincushions are my favorite, I find them more useful, but I have traditional pincushions scattered around my sewing room, because they are pretty! Traditional are the best – the magnetic one gets messy and you end grabbing more than one pin. I have both but prefer the magnetic because I have dogs and cats and if the pins fall on the floor they may pick them up to chew on. Love the cactus, think I will make one. Definitely the plain old fashioned kind, I still use the tomato with attached pin sharpener! I prefer the traditional ones that way the pins don’t all stick together if you set some down for some reason. I prefer the traditional pin cushions. I have several and they all get used. Prefer magnetic; pins are easier to keep in place. I love the traditional pincushion as a nostalgic decoration in my sewing room and the functionality of sharping the dull pins. My sister has made me a few fun traditional pincushions which I love! Perhaps I should reciprocate with this cute cactus! I would love a magnetic one. Thank you so much. I like to have both. I prefer to pick up pins from the traditional pincushions, because they’re easier to grab, but for neatness when I have pins scattered all around, I prefer the magnetic for a quick pick-up. However, pins and needles are easier to grasp and remove from the traditional pin cushion when I want to put pins into my sewing project. The ideal pincushion might be a blend of the two types… a magnetic tray (cushion) surrounding a traditional pin cushion… but I’ve not seen such a thing yet. I might have to think about making one for myself. I like traditional one. They are sew cute! I prefer magnetic pincushions. I don’t even have a traditional one! I use both. What a cute catus design. Thank you for the opportunity to win the tools. Both have their place.i use the pincushion when doing hand sewing.the magnet one for everything else. I like both, there are places for both, on my cutting table I prefer the magnetic and close to my sewing machine I prefer the traditional ones. Honestly, I’ve never used a magnetic pin holder…although after dumping pins on the carpet several times, it sure sounds like a good idea. I do use one pin cushion that one of my daughters made in middle school…love it but it is falling apart…someday I’ll replace it! I know nothing about magnenic pincushions since I have never used one But Ireally like regular one in different shapes. I have a traditional pin cushion, but I have been tempted to get a magnetic one simply because I have a bad habit of taking pins out of my project and lay them beside my machine. I had a magnetic pin cushion and it was so well used it got holes so now I’m using a regular pin cushion that a dear friend made for me. Pin cushions are far more fun. Get tired of one, make another. And, they are so darling in the fabrics we have to choose from. thank you for the giveaway. My supplies are looking pretty sad right now, after years of use! Traditional! Magnetic ones magnetize the pins which then stick to anything metallic in the area and that irritates me to no end! i have both and I think they both have wonderfully different uses. But…I made the most precious traditional one out of a little Goodwill basket I picked up for a quarter that is my favorite, and I leave this one on my desk to keep my favorite needles for when I’m hand sewing. So I guess they both have they’re places, but I’m a sentiment, so I’d have to say my favorite are the traditional. Magnetic pin cushions! They are the best!! I use both and I like both. I get frustrated with certain pincushions that make it hard to stick the pins in without coming out the other side but I also have to wrestle the magnetic pin holder away from grandchildren who love to play with it. Thanks. I really prefer the traditional, much better in my opinion, thanks! I like a traditional pincushion. I have never used a magnetic one. I actually have a metal pin box. I’ve been stabbed by too many pin cushions and I can’t get the pins out fast enough with a metal one. I also have that many pins that the box just works better. I poreferr traditional because the pins stand up right and its just easier to get a pin and keep moving. I might be telling my age but I have to say Traditional is the way I was taught & will always us one, especially the cute ones. But, I love me some magnetic ones when I am in the zone. I have both and use the traditional ones most often. I use a traditional most of the time. I do like to use a magnetic one to find pins that drop to the floor. I think the magnetic ones are easier to use but the traditional ones are much cuter. Honestly, I usually just keep my pins in a box so I can just grab what I need without taking the time to stick them into a cushion. Definitely traditional. I like cute pincushions, and they make the pins easier to grab and put away. I have both, but I prefer my magnetic pin holder because I don’t always watch where I am putting My pins. I prefer the traditional pincushion. Mostly the ones I make, so I can put in the fillings that I like. Nothing organic. I like traditional but I would like to try magnetic someday. How adorable!! I prefer traditional pincushions. I really like magnetic, but I love this idea it is so cute. I’ve actually only dealt with “Traditional” ones…but I’m sure the magnetic ones would be great too. I defenity like the traditional. I have a pig he is so cute. I like both. Do like the traditional ones & the different designs you can make. I love the cactus one, will be making one soon. Thanks for the give away. I prefer the traditional pin cushion because I use the emery strawberry a lot. The magnetic ones don’t have them. Although I do use a magnetic wand to pick up my spilled pins. I like both kinds. I love pincushions. This has been sew much fun. I don’t use either now. 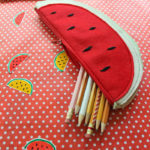 Had the traditional tomato pin cushion in school sewing class–where did that go? Recently someone gave me a finger ring pin cushion. I hope to use it when I am doing hand sewing, if I ever get around to it again. In the meantime, I have pinds in a dish and a peanut butter jar. I like the cuteness of traditional ones, but I prefer the functionality of the magnetic ones. Have a great day! I have a traditional pincushion, but would like to try a magnetic one too. Traditional is the only way to go. Honestly, I have not ever owned a magnetic pin cushion, nor have I seen one. Since I’ve only ever used the traditional way I’m not even sure I would use magnetic. I’m at the age where I remember how Grandma use to do it and I like those old ways. Gives me a sense of peace knowing that Grandma is close guiding me. I like both. The magnetic ones are great when you drop a pin or needle. Traditional in on a thread catcher. I love novel pin cushions. This one is really unique. I and my arthritic fingers prefer the magnetic ones. Fantastic project, he’s so cute! Hope you don’t mind us featuring on one of our quirky sewing pattern blog posts 🙂 Keep ’em coming, great work!